Van rentals, convertibles, luxury cars, SUVs and sports cars are some of the most popular & highly rented categories at the Kona International Airport. Rent a car for Kona International Airport in just three quick steps - search, compare, reserve! Cancel your Kona International Airport car rental for free, up to 48 hours before the pickup time. At USA Cars Rental, we take pride in our tie-ups with leading car rental suppliers in United States. Our circle of suppliers allows us to present low priced Kona International Airport (KOA) car rental services to both business travelers and leisure travelers. You can also rent a car at Kona International Airport to commute to locations at the outskirts of Hawaii and select from a wide fleet of cars. Our vision is to offer easy to book car hire services for Kona International Airport to let your enjoy liberty to plan your stay, in accordance to your Hawaii itinerary. You are enticed to various deals and inclusions. Kona International Airport is located in the town of Kalaoa, west of the Hawaiian County, USA. The airport primarily serves the population of Kailua-Kona. The guests staying at the resorts of the North Kona and South Kola districts also use this airport for all their travel needs. This airport is managed by the state government of Hawaii. The runway of this airport is located at a height of 11,000 ft. Kona International Airport is the only remaining airport in the entire region of Hawaiian islands, which uses a mobile ramp to plane and deplane the passengers. The airport is well equipped and provides all the basic facilities to ensure a comfortable journey for its travelers. You can rent a car at Kona International Airport to travel anywhere to and from the airport. Kona International Airport is not only used by passengers to board flights to various destinations but is also utilized for transporting cargo and mail. The terminal at the Kona International Airport is a single story building with an open-air structure. Public parking facility is available at this airport. You can pick the parking ticket from the automatic ticket dispenser and easily pay the cash at the exit. In case of any emergency or problem you can contact the AMPCO helpline. You will get good quality food and drinks at the airport. Few restaurants at the airport are Tiare’s Lei Stand and Cho’s Lei Stand. If you need any assistance in traveling then feel free to talk to the staff at the Travel Traders desk at the airport. Third youngest shield volcano on the Island of Hawaii. 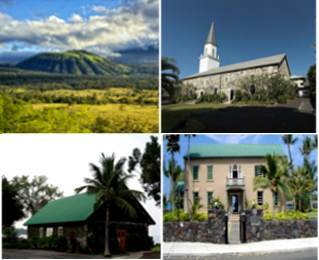 This historic church is known to be a valuable heritage site in Hawaii. Also known as Living Stones Church, this place is worth to visit. Belonging to the blue blood of Hawaii ,this palace is now a museum exhibiting antiques. Comprising of clear blue waters and pristine white sand.